Modern meets classic in your outdoor space! 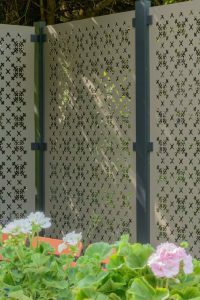 A range of contemporary screens for your garden boasting an elegant 17th century design has been launched in a new collaboration between Stark & Greensmith and the Royal Horticultural Society (RHS). The Parterre range includes four laser-cut panels, which can add instant ‘show garden’ impact and privacy to a space, featuring beautiful designs inspired by images from the world-famous RHS Lindley Library. Intricate engravings of knot gardens and parterres from ‘The English Gardner’ by Leonard Meager (c1624 – c1704), first published in London in 1688, have been referenced in the new panel design by Stark & Greensmith’s creative director, Martine Le Gassick. 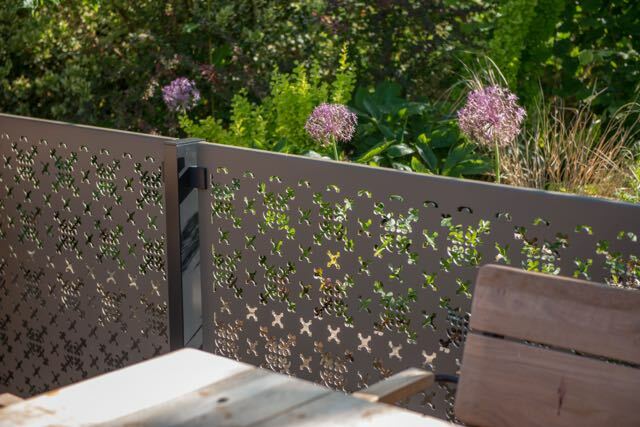 Available in both full-height (1.78m H x 1.19m W) and balustrade (0.93m H x 1.48m W) panels, and in two finishes – corten steel and a new warm grey-hued powder-coated aluminium – the stunning RHS-endorsed screens can be used as boundary fencing and on terraces or decking to create a dining or seating area. They can also act as solar shading in pergolas, for screening in the garden, or formally as garden dividers to create ‘rooms’. Priced from £388 for balustrade and £475 for full-height Parterre panels. DESIGN TIP – to add real ‘wow’ to a space, position the panels against a wall and light from behind. Stark & Greensmith’s panels are popular with householders wanting a ‘show garden’ look at home and garden designers for their aesthetics and functionality. Gold medal-winner Tony Woods used a bespoke design from the company for his RHS Chelsea Flower Show Urban Flow show garden which scooped Best Space to Grow Garden. Stark & Greensmith panels also featured on Tom Massey’s main avenue Lemon Tree Trust show garden. The core Stark & Greensmith range is predominantly inspired by nature with the best-selling design Branches designed to simulate the effect of dappled sunlight through foliage. Other designs include the Japanese-inspired geometric Motif and the floral Burst and Drift. The panels retail from £275, with a range of fixing accessories also available. The panels are affixed by steel clamps to aluminium posts, set in concrete just like traditional fence posts. They are available from 191 trade installers and 16 retailers across the UK. In addition to the standard range, Stark & Greensmith also undertakes bespoke commissions, with current projects ranging from single panels in domestic settings, through to major commercial, leisure, hospitality and public realm commissions. 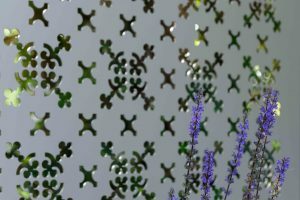 Made either from recycled steel or powder-coated aluminium, the long-lasting panels are laser cut with a range of beautiful botanical designs. Unlike conventional fencing, the panels are maintenance-free, wind resistant and improve with age – the materials used mature rather than deteriorate. Alongside their contemporary and sustainable design aesthetics, the panels are hedgehog-friendly. When installed they float 11cm above the ground, enough room for the protected mammals to pass freely under them. Developed by Stark & Greensmith’s creative director and designer, Martine Le Gassick, the panels are a reaction to the disappointing look, short lifespan and susceptibility to bad weather of traditional fencing. Having worked with well-known brands such as Diane von Furstenburg, Etro and Victoria’s Secret with her previous company, Martine set about designing an affordable, modern yet practical fencing alternative for the garden. When the range was launched it scooped the prestigious Best in Show award at the Landscape Show.